Barry Burns is the multi-instrumentalist extraordinaire from Glaswegian post rockers Mogwai. Having been with the band since their classic second album Come On Die Young in 1998, Burns contributes flute, guitar and vocals, but is perhaps best credited for his work on the keyboards, which provides a classical element to their rock works. 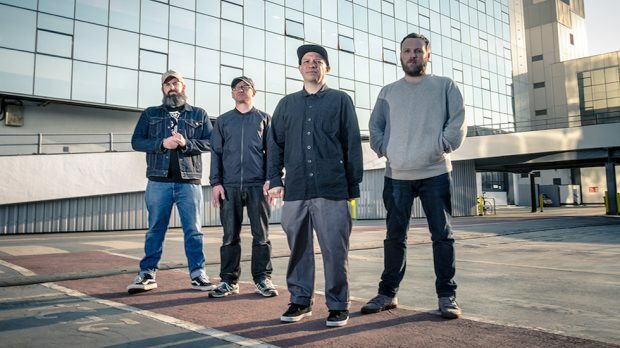 Now 20 years on, he returns with Mogwai to Perth Festival for a third time, following on from the release of their ninth studio album last year, Every Country’s Sun. Taking time out from running his bar, Das Gift, in chilly Berlin, Burns talks to Q ahead of their upcoming show at Chevron Gardens this Friday, March 2. If their performance at previous Perth Festival shows are anything to go by, fans are in for an earth-shattering set of intense noise. BYO earplugs. Fantastic to see that Western Australian fans will get the chance to hear the new album Every Country’s Sun live when you return to the Perth Festival in March. You’ve played with the festival twice before and Mogwai are becoming regular favourites. What keeps bringing you back to this festival and to Perth? They keep asking and we keep saying, “yes please”. Unless it’s somewhere we won’t travel for political reasons (or otherwise), we’re usually up for anywhere nice. Your new album Every Country’s Sun has been out for six months now. How do you feel it is being received from fans and in the live set? Pretty well on both counts I think. It feels like such a long time ago that we wrote and recorded the album that I’m quite ready for another one but the big machine sort of disallows that process. Although it wasn’t aimed at being a themed album, I found it hard not to visualise blazing stars, sunsets and solar eclipses. It also feels almost isolated and introverted. Are these feelings that you set out to create when writing the tracks? If not, what themes or ideas were driving the scores? No but that’s what I quite like hearing from people who listen to any of our tunes. The wee stories or images they have in their head and they tell us and we invariably think, that’s funny or interesting. I don’t think any of us have set out to make somebody think anything other than, “I hope you like this”. Nothing was driving the music other than the fact that we enjoy writing music. Were there any other inspirations or intentions behind the album? No. I wish I could make up something. It may be too soon to ask, but is there any new material in the works – and can you give us any ideas as to what your new directions might be? Or what is the band, as a whole or individuals, working on at the moment? We just finished recording the soundtrack to the movie KIN and we’ve just had a soundtrack rejected that we were hoping to get. But you have to look on the bright side… means me and my family can go on holiday for longer. I don’t know what the new songs will be like until the writing begins, and even then, it’s all up to the mixing to see what you made from the early scraps. My memories of your first Perth Festival billing was a dark and very loud, bass-heavy set, while Rave Tapes brought a mesmerising visual light show to accompany the futuristic album. Every Country’s Sun bridges the two with elements of that classic Mogwai post rock and synth, but the tracks are more minimalist. What can we expect from your live performance this time around? I dunno if I’d say they were more minimalist… it doesn’t feel like it when some of these songs are played live. But yeah, we get asked a lot what people can expect and the answer is always: a Mogwai gig. You’ve got a busy tour schedule ahead this year taking you to some really big name festivals (Primavera, Roskilde). How does the show change between the big stadium festivals and boutique gigs like Perth Festival? Do you have a preference from a creative perspective? I think we try not to think about where we play too much but sometimes you just get an inkling of what you should play. Mostly Friday and Saturday gigs are rowdier than weeknight shows and most festivals are the songs that we think sound good in a less intimate space. John Cummings retired from the band prior to Every Country’s Sun and you have been touring with Alex Mackay and Luke Sutherland since. Who are you bringing with you to Australia on this tour? Are there any new permanent changes to the band line up? Luke’s gone off to work on his own so it’s Alex and for this Asia trip Cat Meyers from Honeyblood on drums. The band proper is just the four of us though. Everyone else is only for touring. Following Perth Festival, you head east for headline shows in Sydney and Melbourne, plus Golden Plains. What are you looking forward to while you’re in Australia? Of course some heat. Berlin is pretty freezing at this time of year. And some decent Asian food. I was thinking about hiring a car and dying of thirst in a desert but I am not sure if anyone will chum me. I remember that. Couldn’t have seen us move faster.